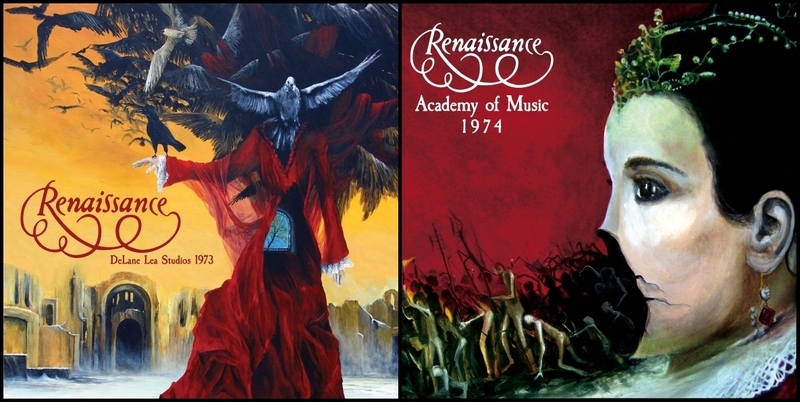 Esoteric Recordings Release Expanded & Remastered Renaissance Titles “A Song For All Seasons,” “Ashes Are Burning” and “Prologue.” The band’s latest release “A Symphonic Journey” is also available through the label. Expanded & Remastered versions of Renaissance’s “Carnegie Hall,” “Scherezade” and “Novella.” are soon to follow! Esoteric Recordings are pleased to announce the release of a newly re- mastered and expanded edition of the classic 1973 album by Renaissance, “Ashes Are Burning”. Formed in 1969 by former Yardbirds members Jim McCarty and Keith Relf, by the 1971 Renaissance had undergone a series of line-up changes and had evolved into a completely different band from the one that had recorded the albums “Renaissance” and “Illusion”. By June 1972 Renaissance had signed to EMI’s Sovereign label and had settled into a line-up featuring the highly gifted vocalist Annie Haslam, John Tout (keyboards, vocals), Jon Camp (bass, vocals), Terry Sullivan (drums, percussion) and Rob Hendry (guitar, mandolin, vocals) who recorded the album “Prologue”, featuring material written by Michael Dunford (a member of the group who had decided to eschew performing with the band to concentrate on song writing) and lyricist Betty Thatcher. This Esoteric Recordings edition has been re-mastered from the original Sovereign Records master tapes and adds a previously unreleased thirty minute live performance for BBC Radio One’s In Concert programme in 1974 (recently discovered in the archives). By June 1972 Renaissance had settled into a line-up featuring the highly gifted vocalist Annie Haslam, John Tout (keyboards, vocals), Jon Camp (bass, vocals), Terry Sullivan (drums, percussion) and Rob Hendry (guitar, mandolin, vocals). The album “Prologue” was recorded in June and July 1972 and featured material written by Michael Dunford (a member of the group who had decided to eschew performing with the band to concentrate on song writing) and lyricist Betty Thatcher. Featuring such classic material as the album title track, “Kiev”, “Spare Some Love” and the epic “Rajah Kahn”, “Prologue” was also notable for the presence of guest musician Francis Monkman (of Curved Air) who would play VCS 3 synthesiser on “Rajah Khan”. The album would pave the way for the future success of Renaissance and would effectively be regarded as the band’s first true album. This Esoteric Recordings edition has been re-mastered from the original Sovereign Records master tapes and adds the rare single version of “Spare Some Love” as a bonus track (appearing on CD for the very first time). The booklet features a new essay and exclusive interviews with Annie Haslam and Terry Sullivan and fully restores the original album artwork. Symphonic Rock Recordings is delighted to announce the release of a new 2 CD and DVD live album by Renaissance, “A Symphonic Journey”. This wonderful recording captures in sound and vision a very special concert staged at the Keswick Theatre in Glenside PA, USA on 27th October 2017. Renaissance perform an extensive set of classic material with the Renaissance Chamber Orchestra, an ensemble especially formed for a series of American concerts. Annie Haslam comments: “Renaissance has touched so many hearts across land and sea, for what seems to be most of a lifetime now, in the performance of this exquisite and unique music. I cannot imagine my life apart from being the ‘voice’ of Renaissance, to carry our message out into the world. For a long time now it has been a dream of mine for Renaissance to perform ‘live’ again with an orchestra, but the how and when of this was unclear. I felt however, deep inside that it would one day come to pass. “I was filled with pride and overwhelmed with emotion when we finally stepped onto the stage for this performance. To look over my shoulder and see all of the classical musicians with their instruments, brought back my vivid memory of our orchestral performance forty years ago in London, of Renaissance at The Royal Albert Hall with The Royal Philharmonic Orchestra. “Renaissance band members Rave Tesar, Mark Lambert, Leo Traversa, Geoffrey Langley and Charles Descarfino are impeccable on this DVD in their performance of the timeless music. In the culmination of a perfect blend with the Renaissance Chamber Orchestra who graced our stage, how wonderful it was and is to be able to share this incredible, unforgettable evening with our loyal supportive fans who have accompanied us on this musical-spiritual journey”. “A Symphonic Journey” captures on two CDs and a DVD (NTSC / Region Free) the magic of the concert and features such classic material as “Trip To The Fair”, “Carpet Of The Sun”, “Mother Russia”, “A Song For All Seasons” and “Ashes Are Burning” and is a fine souvenir of a perfect musical evening. Day of the Dreamer Tour – Music Legends Renaissance Featuring Annie Haslam in Support of Their New DVD Release to Play Select US Dates Fall 2018! Music legends Renaissance featuring Annie Haslam will be back in the US Northeast playing select dates in November 2018. Based on the great success in 2017 with the addition of a “10-piece Chamber Orchestra” on four of their shows, the band has been invited to once again bring this special line up to the Scottish Rite Auditorium, Collingswood, NJ. November 17th. 2018 marks the 49th year since the band’s formation and its tenth consecutive year of touring since their reactivation in 2009. On September 14th Renaissance will be releasing their new DVD entitled ‘A Symphonic Journey’. The DVD was filmed in October of 2017 and included for the first time the addition of The Renaissance Chamber Orchestra, a hand-picked group of 10 musicians, including strings, woodwind, brass and percussion. 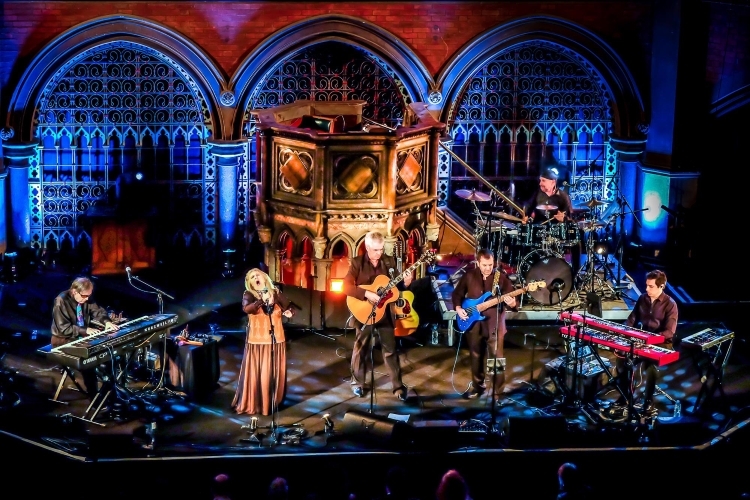 This is their third DVD release preceded by the 2015 ‘Live at the Union Chapel, London, England’ and the ‘Turn of the Cards/ Scheherazade and Other Stories’ 2011 release ‘Live’ at the Keswick Theatre, Glenside, PA. For this new DVD the band once again returned to the Keswick Theatre, this time employing the use of track and boom mounted cameras to create more up close and personal shots of the band and orchestra. The concert also featured large screen projections of original paintings by Annie Haslam, with corresponding titles to each song performed throughout the concert. 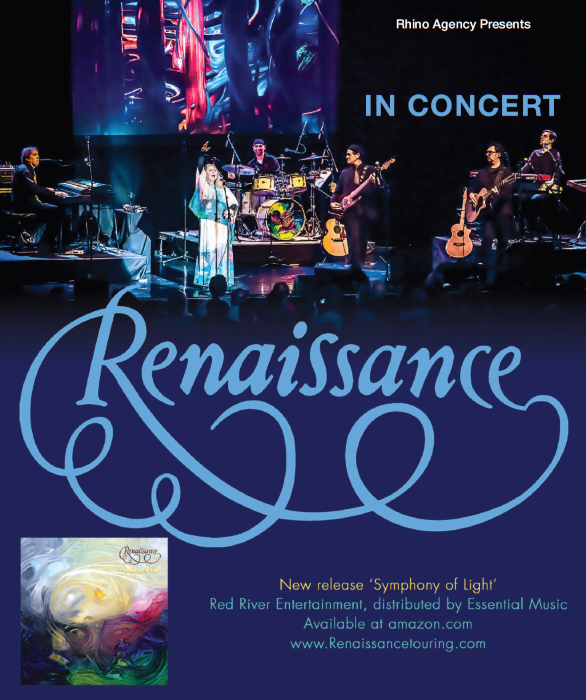 A Symphonic Journey With Renaissance – Music Legends Renaissance Featuring Annie Haslam To Play Selected Dates With 10-Piece Chamber Orchestra! Following their successful South American tour, Renaissance featuring Annie Haslam will be back in the US Northeast in October and November 2017 debuting their “Symphonic Journey” tour. This tour will include four very special concerts featuring a “10-piece Chamber Orchestra” (a handpicked assemblage of strings, woodwinds, brass, and percussion); October 26th at the Ridgefield Playhouse in Ridgefield CT, October 27th at the Keswick Theater in Glenside PA, Town Hall in New York City October 28th and The Egg in Albany NY on October 29th. These performances will be the first time in 40 years that Renaissance will perform on stage with a “live” orchestra and, in addition, 2017 marks the 48th year since the band’s formation and its ninth consecutive year of touring since their reactivation in 2009. London, UK – Much to the excitement of music fans in the UK, progressive rock icons Renaissance featuring legendary singer Annie Haslam will be performing in the UK in April 2015! Renaissance is a band with a rich history unique unto themselves as progressive rock pioneers who rose from the ashes of the seminal UK rock band, The Yardbirds. Acclaimed for their unique blending of progressive rock with classical and symphonic influences, the band’s career has spanned forty plus years spearheaded by the 5 octave voice of Annie Haslam and the masterful songwriting skills of Michael Dunford. They are widely considered to be the band that most successfully and routinely utilised the sound of a full orchestra in their recordings. Los Angeles, CA – Cleopatra Records will be releasing two rare live albums by UK progressive rock legends Renaissance. The first release on February 3rd is ‘DeLane Lea Studios 1973’; a captivating live-in-the-studio recording from Renaissance performing to a small gathering of friends at the historic DeLane Lea Studios in London (used by everyone from The Beatles to Queen, Jimi Hendrix & Pink Floyd). Beguiling vocalist and ingenue Annie Haslam leads her group through nearly the entire fourth album ‘Ashes Are Burning’ with special guest appearances by Wishbone Ash’s Andy Powell and folk singer Al Stewart! Renaissance’s ‘Academy of Music 1974’ will be released on March 31st and is an astonishing live performance of the ensemble at the height of their career. The concert showcases the band’s latest release at the time ‘Ashes Are Burning’. Unlike other prog-rock groups, Renaissance forwent much of the technology in favor of acoustic instruments and orchestral arrangements. Electric guitars and synthesizers were seldom used, giving the band’s music more of a symphonic sound. 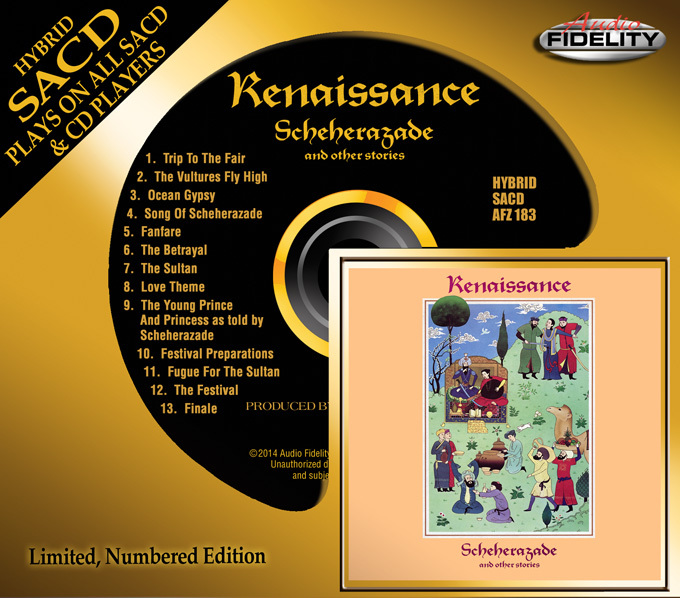 Camarillo, CA – Prog fans worldwide are buzzing with excitement over the forthcoming release of Renaissance’s legendary Prog album ‘Scheherazade and other stories’ by Marshall Blonstein’s Audio Fidelity on limited numbered Hybrid SACD. 1975’s ‘Scheherazade and other stories’ is a beautifully crafted album, expertly sung and played by Renaissance. The recording is filled with lush, orchestral progressive pop-rock and considered by many music critics to be their best album. Unlike other prog-rock groups, Renaissance eschewed much of the technology in favor of acoustic instruments and orchestral arrangements. Electric guitars and synthesizers were seldom used, giving the band’s music more of a symphonic sweep. Renaissance is a band that went through various permutations, the best known being the line up featured here and they shine throughout the album: Annie Haslam’s soaring, pure vocals, John Tout’s considerable piano prowess, Jon Camp’s imaginative bass, Michael Dunford on guitar and Terence Sullivan on drums. There are only four pieces on the album: “Trip To The Fair” is a heavenly 11-minute dreamscape. “The Vultures Fly High” is a short but very effective prog-rocker. “Ocean Gypsy” is a gorgeous song, and one of the band’s all-time classics. And then, of course, there’s the 25-minute, nine-part epic, “Song Of Scheherazade,” one of the highlights of rock history featuring the prog icon’s unique interpretation of the Scheherazade legend accompanied by the London Symphony Orchestra and a chorus. The classical tale is told about the Sultan and the magical woman, Scheherazade, who ultimately wins his heart.